This week, the Leadership Conference Education Fund released a new report demonstrating that groups working to pass legislation allowing carveouts often do so to expressly deny or limit civil rights advances for minority communities. 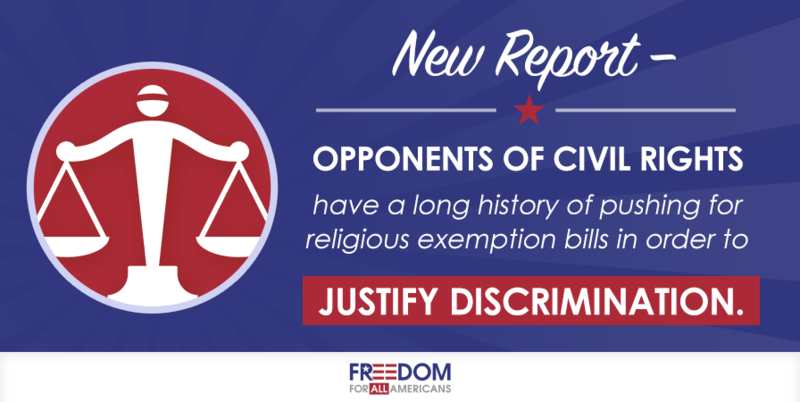 For centuries, the report details, religious exemptions bills have been pushed to limit equality for people of color, women, and people with disabilities. You can read the full report, Striking a Balance: Advancing Civil and Human Rights While Preserving Religious Liberty, here. The release of the report coincided with an in-person event on Monday, February 1 in Atlanta, Georgia – where more than a half-dozen religious exemption bills have been introduced to grant opponents of LGBT non-discrimination a license to discriminate against LGBT people. In fact, dozens of so-called “religious freedom” bills are currently pending in states across the country, including Florida, West Virginia, Indiana, Tennessee, and South Dakota. The event yesterday detailed that these current bills are not much different in intent than those that came before — the difference is simply the target. The report takes a detailed look at the legal evolution of how policymakers and the judicial branch have interpreted religious liberty, highlighting a marked shift in the wake of the 2014 Supreme Court Hobby Lobby decision. The federal Religious Freedom Restoration Act, which is often cited by lawmakers currently pushing religious exemptions bills, was actually drafted with a narrow but specific scope to protect religious minorities. The law would, for example, protect a Muslim woman who was denied a job because she wears a head scarf. The U.S. Supreme Court’s ruling in Hobby Lobby, however, is giving oxygen to bills that allow religious arguments to be used in justifying discrimination against LGBT people, women, and even the same religious minorities the original federal law set out to protect. See other tweets from the event – and be sure to check out the report here.